Its Spurrier week for UGA and coach Mark Richt. Happy Tuesday. Got a big day planned? Is it already hard to be productive this week at work with the thoughts of handing another loss to You-know-who coming to Athens this week? Give Steve Spurrier all the credit in the world. He’s an all-time great at what he does and the former Heisman Trophy winner probably retired the belt for giving SEC writers interesting copy on the regular. Who can forget that he advised UGA coach Mark Richt when he was still at Florida State to not take the UGA job? That’s interesting, but not as intriguing as the fact South Carolina has gone 5-5 against UGA since Spurrier’s first season in 2005. The Gamecocks have also won four of the last five meetings between the teams. So what’s going on with UGA recruiting? Well, you’d never miss a beat if you signed up for the DawgNation Daily email newsletter which curates the best of the AJC’s team and recruiting content every day. Coach Mark Richt and his staff have been in constant contact with the nation’s No. 1 overall prospect for quite some time now. UGA is now also digging in to make a serious run with the nation’s No. 2 overall prospect. That’s Texas OL Greg Little. He’s set up his five official visits for this fall and UGA will be one of those. Little has an All-SEC lineup of official visits in mind for this fall. 247sports.com’s Rusty Mansell reported yesterday that Little has scheduled his UGA official visit for the Alabama game and also that UGA assistant coach Bryan McClendon made a special trip to Texas to visit with the 5-star offensive tackle prior to the Vanderbilt game last week. UGA is graduating two starting tackles this fall and it’s not secret that an elite tackle like Little or Willie Allen or JUCO prospect Demetri Moore can come right in next fall and grab some serious playing time if not an outright starting position on a marquee offensive group that should still feature a Heisman Trophy candidate in Nick Chubb. The big-time football programs are always looking for ways to distinguish themselves from the other program’s out there. If you don’t believe that, just tally up the rise of the indoor practice facilities that have been built or greenlighted around the Southeast over the last three years. The “edit’ is another way to do that. That term invovles the skills of a graphic designer to create mocked-up images of star recruits in the colors and uniforms or imagery of a certain school. Ask a recruit what they notice in terms of recruiting pitches these days and the term “edit” will usually come up. DawgNation examined the trend and what sort of buzz that “edits” can generate among recruits. 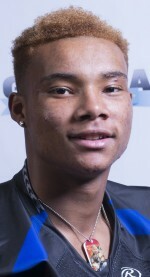 Savannah resident Demetris Robertson continues to be one of the more fascinating recruiting sagas of the 2016 class. He told the AJC this weekend that he was taking four AP classes this fall. Academics will make his college decision. Stanford remains his leader, but Cal and Notre Dame have crept into the picture for him. Robertson recapped his great visit to Notre Dame earlier this month with DawgNation. Some recruits talk about a “40-year decision” in terms of their recruiting mindset, but Robertson appears to be on a quicker timeline than that. He has that NFL dream like all most blue-chip players, but he’s zeroing in on a degree from a prestigious school which might have him retired before those 40 years are up no matter the mark he makes in pro football. Its important to note he de-committed from Alabama after having been pledged to that school for over a year. He also has Georgia Tech among his top group. There’s one other thing to note about Roberston: His defensive ability often gets overshadowed by his tremendous speed. He plays running back for Savannah Christian this fall, but some of the best highlights he’s made so far have been on the defensive side of the ball. He’s not shying away from the contact this year. UGA played an NCAA-high 19 true freshmen in its season-0pener against ULM. Well, that trend continued during the team’s first road trip in SEC play. The football program’s official Twitter account shared this message on Monday. The infographic lists the 29 names that played on defense for UGA against Vanderbilt. The telling stat among that defensive breakdown is that 11 of those 29 Bulldogs that saw action against Vanderbilt are freshmen. UGAsports.com’s Radi Nabulsi noted yesterday that there were nine true freshmen on the field at one point for UGA in Nashville. 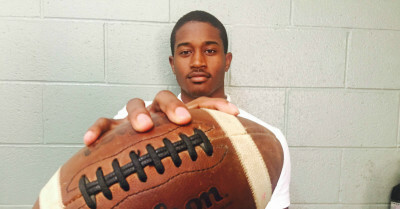 Hapeville Charter cornerback William Poole III told the AJC last Tuesday that UGA was “his most preferred school.” Well, he’s going back to a place he said felt like “home” this week. He’ll be in attendance at the South Carolina game this week. He’s not going with anyone specific, but this should be his third trip to UGA since the summer. Poole told the AJC earlier this month that he will be at UGA for the Alabama game, too. His top schools at the moment are UGA, Alabama, Clemson, LSU and Virginia Tech, but he’s not ready to name a Top 5 yet. Those are just the schools that are recruiting him the hardest right now. Poole feels he won’t be ready to commit until after his junior season. He expects to commit either before or during his senior year. He’s looking to pursue a degree in computers and computer science. There’s a lot of information pipelines out there for UGA football information, but its pretty hard to top the behind-the-scenes access offered by “Inside UGA football with Mark Richt” every week. That’s the official UGA coach’s show. The production quality of the show continues to hover around 5-star status. Click the link for an insider’s perspective of the road trip to Vanderbilt and that always excitable Scott Howard play-by-play audio. There’s highlights on the Vandy game and an inspiring feature on the amazing comeback story of UGA tailback Keith Marshall. McEachern junior receiver Tyler Smith suffered a knee injury two Fridays ago in a huge win against Buford. Well, he shared the extent of that injury on Monday morning via his Twitter account. Smith is a key UGA target given his status and connection with classmate Bailey Hockman. Hockman became the first member of UGA’s 2017 recruiting class this summer. The 5-foot-10, 170-pounder is rated by the 247sports composite as the No. 26 receiver in the 2017 class. He’s also listed among the nation’s top 200 overall prospects. Smith told the AJC this month that North Carolina, Auburn and UGA — in no particular order — were the three schools atop his leaderboard. Auburn will be an interesting factor in his recruiting as his cousin Brad Ware played safety for that program. Are you keeping up with the DawgNation Daily podcast? Nothing could be finer than getting an IV full of UGA-related discussion and information while amid a morning traffic snarl or during a morning workout. Monday’s edition focused on quarterbacks of the past, present and future. 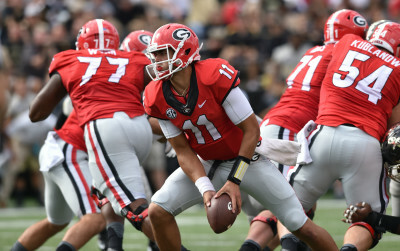 Should we be worried about Greyson Lambert? What’s up next for Brice Ramsey? 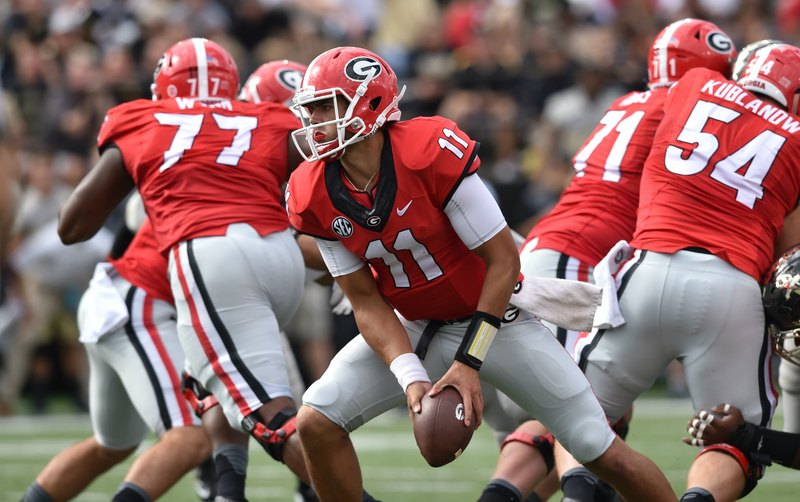 Just how good is this Jacob Eason kid? There’s a pair of very important UGA targets that will also make a long out-of state trek to UGA this weekend. 5-star RB Anthony McFarland, Jr. and 4-star DE Chase Young from Maryland’s DeMatha Catholic appear to be making the trip. McFarland tweeted out an indication of their Saturday afternoon schedule on Monday evening. Me and bro down Georgia this weekend @youngchase907 ? DeMatha is currently ranked No. 4 in the nation in this week’s USA Today National Super 25 poll. Young recently picked up an offer from UGA as his recruiting has exploded with Power 5 offers galore this month. The 6-foot-5, 220-pounder is rated as the nation’s No. 10 DE for 2017. By the way, isn’t “Chase” just about the best name ever for a defensive end?